Lt. Col (Ret) Philip Henry McBride passed away unexpectedly in Washington D.C. on Saturday, August 5th, 2017, while in the employ of Delta Airlines. He was born on April 5th, 1956, in Mobile, Ala.
“Phil” was one of six children born to an American father, Walton E. McBride, Jr., and a French mother, Lucile Finas McBride. His formative childhood years were spent in the Lorraine region of France, where his father was a civil engineer at the small American airbase of Etain-Rouvres, east of Verdun. After graduating from Garden City High School in Garden City, N.Y., with the class of 1973, he attended the USAFA Preparatory School at the United States Air Force Academy (USAFA) in Colorado Springs, Colo., and received his appointment to the Air Force Academy a year later. He played Division I soccer for the Air Force Falcons and was named all-conference his sophomore and junior seasons. For his senior year, he was selected as one of seven cadets to represent the Air Force Academy in Salon-de-Provence, France, as a member of the semester-long French Exchange program between the two academies (USAFA and the École de l’Air). He was commissioned as an officer in the United States Air Force with the Air Force Academy class of 1978, graduating with a Bachelor of Science in Physical Sciences. After completing undergraduate pilot training in 1980 at Vance AFB in Enid, OK, he was assigned to Warner Robins AFB as a KC-135 pilot. After completing training for the KC-10 aircraft, he remained a KC-10 pilot for the remainder of his Air Force career. After numerous military assignments in Georgia, Southern California, Alabama, France, and Northern California, he retired from the US Air Force as a Lt. Col with 20 years of active duty service. He began his career with Delta Airlines in 1997. 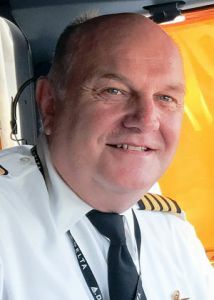 At the time of his death, he was an Atlanta-based captain on the Airbus 320. Phil is survived by his French bride of thirty-seven years, Anne McBride; his son Matthew (Alicia) of Peachtree City, Ga.; his daughter Clare of Brooklyn, N.Y.; his grandchildren Xavier and Louisa; his sister Patricia of Rockville, Md. ; brothers John (Sarah) of Sycamore, Ill., Xavier of Rockville, Md., sister-in-law Tina of Denham Springs, La. ; five nephews, one niece, two grand-nephews and two grand-nieces. He was preceded in death by his sister, Margaret “Minette” McBride; brother, Walton “Ned” McBride III; father, Walton E. McBride Jr, and mother, Lucile F. McBride. A funeral service will be held at 3 p.m., on Saturday, August 19, 2017 at the Chapel of Mowell Funeral Home, Peachtree City. The family will receive friends one hour prior to the service. Gifts in memory of Lt Col (Ret) Philip Henry McBride may be made to the United States Air Force Academy Endowment, 3116 Academy Dr, Suite 200, USAF Academy, Colo. 80840. Checks should be payable to The Air Force Academy Fund.